PLEASE make sure you READ this entire description prior to purchasing... This offer is only valid for those NEW to Young Living - if you already have an account with them I will not be able to complete your order. 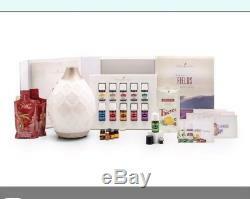 By purchasing this Premium Starter kit, you will automatically become a member of Young Living. There are no additional charges associated with this membership. The good news is should you choose to order products in the future you will have the ability to do so from them directly with a wholesale discount of 24% off of EVERYTHING! Allowing ME to enroll YOU directly provides YOU with significant discounts. Young Living offers a special line for KIDS ALL that I use - their baby wipes are the best ever. FOR REAL THOUGH, cleaning, makeup, pets and more! Your Premium Starter Kit Includes. Young Livings Desert Mist Ultrasonic Diffuser functions as a humidifier, atomizer, and aroma diffuser in one simple-to-use product. Inspired by the design of a stylish Moroccan trellis, the Desert Mist Diffuser brings an exotic and modern look to any space. Product Guide and Product Price List. PERKS OF THE STARTER KIT. Option to join Essential Rewards (hiii free monthly oils). Ability to make this into your own business (IF YOU WANT TO) and qualify for commissions and bonuses just by sharing the products YOU love and helping others become members. The time is NOW to change your life. We all need a toxin free lifestyle and why not make the switch sooner rather than later? With essential oils you have the ability to make EVERYTHING (cleaner, bug spray, hand sanitizer, rollers, soap, bath bombs - just to name a few). The item "Young Living Desert Mist Diffuser and Essential Oil Starter Kit- Free Shipping" is in sale since Sunday, June 10, 2018. This item is in the category "Health & Beauty\Natural & Alternative Remedies\Aromatherapy". The seller is "lotsadox" and is located in Goldsboro, North Carolina. This item can be shipped to United States, United Kingdom, Denmark, Romania, Slovakia, Bulgaria, Czech republic, Finland, Hungary, Latvia, Lithuania, Malta, Estonia, Australia, Greece, Portugal, Cyprus, Slovenia, Japan, China, Sweden, South Korea, Indonesia, Taiwan, Thailand, Belgium, France, Ireland, Netherlands, Poland, Spain, Italy, Germany, Austria, Philippines, Norway, Ukraine, Croatia, Malaysia, Chile, Colombia, Costa rica, Dominican republic.